Trying to relax in yoga class, I hear the instructor say, “Exhale, touch your toes.” Reaching down, I am so appalled by the sight of my feet that I gasp and think, “I need a pedicure ASAP.” Thankfully FACES DaySpa fit me in that afternoon, and as I multi-tasked my pedicure with a writing assignment (I brought my laptop to the service), I noticed a very blissful person beside me. It was Robin Swift (VP of marketing and development for the Coastal Discovery Museum), and she was relishing in the Pedicure Plus—a body and “sole” experience that includes therapeutic reflexology added to FACES’ basic pedicure. Swift maintains a standing monthly pedicure appointment and considers this treatment part of her wellness routine. She believes we all need to invest in ourselves and treatments like this. “Being pampered is very relaxing, and I always leave feeling better than when I arrived,” Swift said. According to the Mayo Clinic, regular spa visits can rub, scrub, cleanse and ease away “anxiety, digestive disorders, fibromyalgia, headaches, insomnia (related to stress), and muscle and nerve pain.” Other studies (reported by the Huffington Post) found that by booking an appointment, you are booking a well-deserved wellness ticket to increased productivity at work, improved mental health, an improved immune system (and therefore fewer sick days), fewer PMS symptoms, and improved self-esteem (due to beautifying and anti-aging treatments, as well as the nurturing effects of self-care). Sargo and Owen both believe that, when you feel beautiful, you feel confident and you excel in all aspects of your life. For over 30 years, Owen has made it her business to empower women by helping them feel relaxed and beautiful—from head to pedicured toe. “The key focus here is not just offering massage. With our products, we want to zero in on what each client wants and needs,” Owen said. “Everything we use in the room or in a service can be bought by a client so they can take their treatment home and get a long-term result,” Sargo added. FACES staff members are encouraged to test and research products and truly get to know their clients so they can best recommend products and services as well as help FACES clients get streamlined on a beauty routine, whether it is monthly pedicures, facials, or massages. In addition to skincare products, FACES also provides makeup and professional makeup services, including special occasion makeup as well as private lessons. Returning customers appreciate a long list of rewards from a 10 percent rebooking discount, to 15 percent off FACES products (after returning empty beauty product bottles for recycling), and other incentive programs. This repartee between staff, services and clients translates to FACES’ newly opened sister space, FACES Lash Studio, which offers three FACES signature lash extension looks (Coy, Captivating and Catwalk), lash tabbing, lash perming, lash tinting, brow tinting, air brushing, and waxing (from brow design to full leg). With its chaise lounges, mirrored tables and black and white marble floors, FACES Lash Studio embodies a glamorous, old Hollywood feel. FACES DaySpa, on the other hand, is more gender-neutral with muted colors and inspirational quotes on each wall. And yet, both spaces reflect Owen, her staff, and their mission to help you actualize your best self. Both spaces invite you to commit to a monthly spa routine, not only because you want to, but also because you really need to—for your own edification and sanity. Don’t miss the fun at FACES DaySpa and Lash Studio, Sunday, November 24, from noon to 4 p.m. Receive a free $30 gift card with every $100 spent on gift card purchases. One-day savings in-store or online at FacesLashStudio.com: 20 percent off a series of 12 lash fills; buy one full set eyelash extensions and get one lash fill for half off. 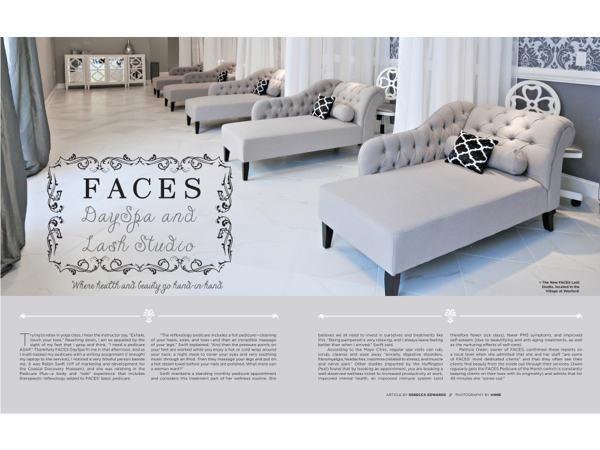 FACES DaySpa and Lash Studio are located in the Village at Wexford on Hilton Head Island. For more information, visit facesdayspa.com or faceslashstudio.com or call (843) 785-3075 or (843) 785-LASH for appointments.